Federal agencies and private architecture, engineering and construction firms can now get a clear, comprehensive picture of all that ProjNet has to offer with the help of a new website, www.projnet.com. More than 45,000 worldwide public and private capital facilities industry stakeholders already use ProjNet™ to exchange and manage their building design and construction information, including documents identified as Sensitive But Unclassified (SBU)/ For Official Use Only (FOUO). "ProjNet is the backbone of the Department of State's engineering and design process," said Robert E. Clarke, RA, Director, OBO/RM/EX/IRM, Bureau of Overseas Buildings Operations at the U.S. Department of State. "It lays the ground rules for State's integrated design review process. We have found that thousands of A/E firms, contractors and suppliers worldwide embrace the ProjNet DrChecks™ system because it helps them get their jobs done." 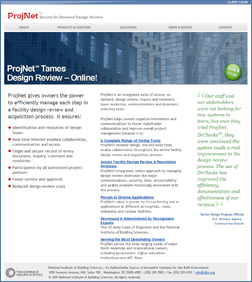 Though ProjNet has been around for more than a decade, up until now the only official information source to learn about the Internet-based design review and approval platform was a user support site. The new ProjNet website gives the wider audience an opportunity to find out about ProjNet applications, features, functions and benefits. Developed by the U.S. Army Corps of Engineers Engineering Research and Development Center (ERDC) and administered by the National Institute of Building Sciences, ProjNet is an on-demand (cloud), paperless system that requires no software installs, updates or maintenance. ProjNet has the only "Sensitive-But-Unclassified" rated system of its type. 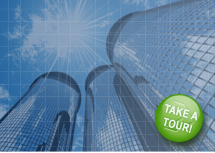 ProjNet provides secure non-alterable archiving of all client design and construction records. Applications within ProjNet are the de facto federal standards for a number of owner-related business processes, such as design review, bidder inquiry and secure international exchange. Its flagship application, DrChecks, received more than 2.6 million design review comments last year. To learn more about ProjNet including a client list, solutions, case histories, and the latest news and events, visit www.projnet.com. The National Institute of Building Sciences, authorized by public law 93-383 in 1974, is a nonprofit, nongovernmental organization that brings together representatives of government, the professions, industry, labor and consumer interests to identify and resolve building process and facility performance problems. The Institute serves as an authoritative source of advice for both the private and public sectors with respect to the use of building science and technology.